BigONE is a coin-to-coin exchange where users can trade in Bitcoin, Ethereum, Litecoin, and other digital assets. 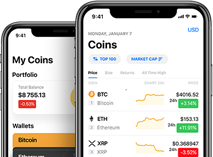 The trading platform launched in November 2017. The CEO is Eric Meltzer. Majority of visitors to the BigONE site are from China, followed by Japan, the United States, Hong Kong and Vietnam.